Mozart appears here as a cherub-like genius, enchanting monks who dare not disturb his heavenly music. In order to emphasize how small and young Mozart was, his legs have been shortened to dwarfish proportions. There are a number of fantasy portraits like this one, and, like this one, many cross the line between art and kitsch. The Young Mozart at the Organ of the Franciscan Church in Ybbs. 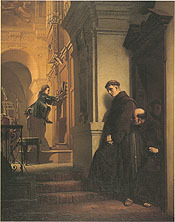 Oil painting by Heinrich Lossow, 1864. [1874?] Original owned by Linz Castle.